- The book was inspired by Charles Lyell's Geological Evidences of the Antiquity of Man of 1863. - One of Verne's main ideas with his stories was also to educate the readers, and by placing the different extinct creatures the characters meet in their correct geological era, he is able to show how the world looked like millions of years ago, stretching from the ice age to the dinosaurs. - This book has been adapted to numerous movies, tv series and stage plays. - A thrill ride based on the book is open at The Mysterious Island section of Tokyo DisneySea's theme park. - A water ride at Water World in Federal Heights, Colorado called 'Voyage to the Center of the Earth' is loosely based on the book. The wonders of Jules Verne's scientific adventures are always fresh. They are uniquely devised and surely they are intricately invented. What adds up to the fun is the seemingly extinct era that can be glimpsed in this book. Would you care to risk your life to see voracious Jurassic creatures? Would you risk the life of a comrade to face the uncertainty of the underground seas? Or would you be happy if you found rare stones and minerals that's available only to you? These are just some of the questions asked in the novel to unravel the true nature of man. Yes it is an adventurous world down there... But it is also dangerous. 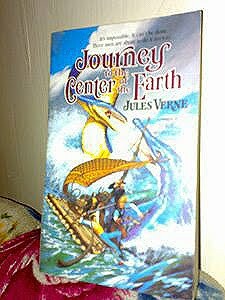 I have to admit Jules Verne is one of my most favorite authors when it comes to science fiction con classic. His writing are very sophisticated already during his time and hundreds of years after it still feels like a wonder. Modern technology are sometimes based on his imaginary inventions. These imaginary inventions serve as inspirations to today's society to create something that could be useful -- like rocket ships used on landing the moon, etc. I would have loved to meet this guy. He is a genius that deserves a great recognition. I could thank him even more for his writings not only because they are studded with scientific gadgets, but also because they are written very well. The wist and plot, especially of A Journey to the Centre of the Earth is well oiled that it flows easily from beginning to end.